The cell. 7. Actin filaments. Atlas of plant and animal histology. The cell. 7. Cytosol. Cytoskeleton. Actin filaments, also known as microfilaments, are one of the cytoskeleton components. Actin filaments are made up of actin proteins. Actin filaments are polarized structures. They have one plus end and one minus end. Actin associated proteins modulate the organization and polymerization of the actin filaments. Functions: cell movement, cell shape, vesicular traffic, cytokinesis, they form microvilli, etcetera. Actin filaments are one of the cytoskeleton components. In animal cells, actin filaments are located close to the plasma membrane arranged in a cortical scaffolding that supports the plasma membrane. In plant and fungal cells, the cell wall protects the plasma membrane so that the distribution of actin filaments in the cytosol is different. Actin filaments are built by polymerization of actin proteins, which can be found in two isoforms: alpha- and beta-actin. Beta-actin is the most frequent isoform and is found in most of the animal cells. The amino acid sequence of beta-actin is slightly different from alfa-actin, which is abundant in muscle cells. Actin is a very abundant protein in the cytosol, approximately 10 % of the total cytosolic protein content. From the total cytosolic actin protein pool, some are found as part of the actin filaments (which is known as F-actin), and the remaining is free in the cytosol (known as G-protein). The proportion of F-actin and G-actin may change depending on the physiological state of the cell, so that the number and length of the actin filaments change by polymerization and depolymerization. Without actin, cells cannot divide, move, do endocytosis, or phagocytosis. Great deal of knowledge about actin filament function has been provided by pathogens. Pathogen manipulation and eukaryotic cell mutants have helped to uncover many of the functional aspects of actin filaments. Common organization of actin filaments in eukaryotic cells in culture. Actin filaments are 7 μm in thickness. This is lower than the thickness of the other cytoskeleton filaments, microtubules and intermediate filaments. That is why actin filaments are also known as microfilaments. Every actin filament has a minus end and a plus end, which means that they are polarized filaments. This is because of the ordered disposition of the actin proteins in the filament, they are assembled keeping the same orientation. In the plus end, the polymerization, adding new actin proteins, is more frequent than depolymerization, whereas in the minus end depolymerization is more frequent. The increase and decrease in the microfilament length is by polymerization and depolymerization, respectively. In the cell, these changes are happening all the time, as well as nucleation and complete depolymerization of microfilaments. Actin filaments are the most dynamic component of the cytoskeleton. However, the concentration of free actin proteins in the cytosol is not enough to spontaneously assembling of actin filaments. Thus, the formation of new microfilaments is driven by protein complexes such as Arp2/3 and formins. Arp2/3 proteins work as nucleation sites for new microfilaments, whereas formins stabilize transient spontaneous associations of actin proteins, boosting the formation and elongation rate of microfilaments. This control of microfilament formation and elongation is very useful for the cell because new microfilaments are formed when and where they are needed. An actin filament is depicted. 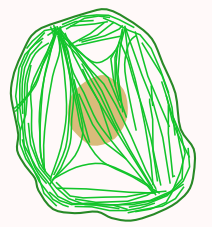 It is showing the helicoidal arrangement of actin proteins. Microfilaments are polarized structures with two ends (minus and plus ends), which show different polymerization and depolymerization rates. Free ATP-actin proteins are prone to join to the microfilament by polymerization. After some time of being part of the filament, the ATP will be hydrolysed to yield ADP-actin proteins. The ADP-actin form constitutes most of the filament. (Modified from Pollard and Earnshaw, 2007). Actin filaments are more abundant, shorter, and more flexible than microtubules (see next page). One of the more salient features of the actin filaments is that they are highly adaptable: are formed and removed easily, and are associated between each other in many ways to form 3D scaffolds. This versatility relies on more than 100 different modulator proteins or actin associated proteins. These proteins influence the filament polymerization and depolymerization rates, nucleation of new filaments, destruction of existing filaments, as well as 3D organization. Actually, there is no naked actin filaments or free actin proteins in the cytosol, but they are always linked to some associated protein. Proteins associated to actin filaments can be divided in different categories. A) Affecting polymerization. Some proteins, such as profilin, join free actin (G-actin) and boost actin filament polymerization. 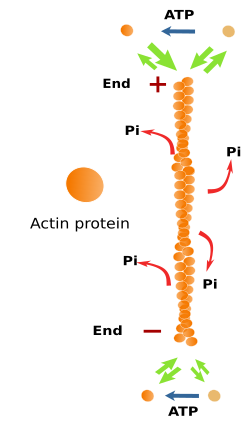 Other proteins, such as thymosin, join free actin proteins and hamper the polymerization process by preventing the spontaneous polymerization of actin filaments. B) There are modulator proteins, such as fimbrin and alfa-actinin, which make cross-bridges between actin filaments to form bundles of actin filaments, whereas other proteins make possible the arrangement of actin filaments in reticular structures. C) Some actin binding proteins, such as cofilin, katanin, and gelsolin, break and reorganize the actin filaments. D) There are also proteins that are intermediaries between actin filaments and other proteins. For example, tropomyosin mediates interaction between actin filament and myosin in the muscle cells. E) Some proteins are in charge of anchoring actin filaments to other cellular structures like membranes and other components of the cytoskeleton. There are additional elements that affect the action of actin associated proteins on the behavior of actin filaments, such as calcium concentration, activity of Rho-GTPases, presence of lipids, and higher or lower gen expression of their genes. There are also drugs that influence the polymerization of actin filaments. For example, cytochalasin inhibit polymerization, whereas phalloidin inhibit depolymerization. Polymerization and depolymerization of actin filaments are under the control of many actin associated proteins. 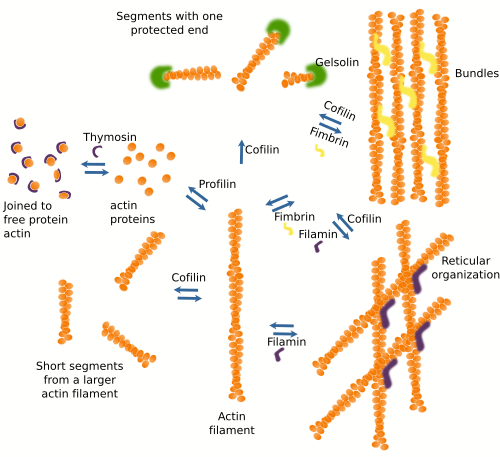 In this image, several organizations of actin filaments are depicted, as well as the actin associated proteins that influence these arrangements. (Modified from Pollar and Earnshaw, 2007). Cell movement. Cells do not swim, they crawl through the tissues, as do, for example, the embryonic cells during development, amoeba when moving around, lymphocytes when heading toward damage tissues, and the growth cone of neurons when searching for their targets. For cell movement, several steps are needed: production and extension of cytoplasmic protrusions, adhesion of these protrusions to some elements of the environment, and drag the rest of the cell toward these anchoring points. The cellular protrusions are known as podia, lamellipodia when they are sheet-like, filopodia when they are thin and long, and lobopodia when they are thick and tubular. When cells are treated with cytochalasin, a polymerization inhibitor of actin filaments, protrusions disappear and cells stop moving. This indicates that actin has a prominent role in protrusions formation. Actually, it is known that it is the actin polymerization what pushes plasma membrane outward and forms the protrusions. Nucleation of actin filaments by Arp 2/3 is very important during the lamellipodia formation. When these protrusions make physical contact with an extracellular element, either extracellular matrix molecules or other cell, adhesion proteins located in the plasma membrane establish anchoring points. Once the cell makes an adhesion contact, intracellular actin filaments, together with the motor protein myosin, help to move all the intracellular content toward the anchoring points. Intracelular movement. Organelles are moved through the cytoplasm individually, and also in groups when the cellular shape is changed. Actin filaments, together with myosin motor proteins, help with the organelle movements. This role is very important in plant cells where most of the internal movements of organelles are carry out by actin filaments, whereas microtubules are the main responsible for these movements in animal cells. Myosin motor proteins walk along the actin filaments propelled by the energy of ATP. There are two main types of myosin: I and II. Myosin I protein contains a globular structure, known as head, that binds to actin filaments, and a tail that selects the cargo to be transported. By means of conformational changes, the head is able to move along the actin filament, dragging the cargo. Myosin I is found in most of the eukaryotic cells and may transport some organelles, but it can also produce deformations of the cellular periphery, such as protrusions. Myosin II is a family of proteins mainly found in muscle cells, although it is also present in other type of cells. This protein has two heads, with motor activity by using ATP, and a tail. Myosin II usually appears in couples linked by their tail. In muscle cells, many myosin II molecules are joined together to form the myosin filaments, known as thick filaments, where every myosin II protein is oriented with the head toward one of the ends of the filament and the tail toward the middle part of the filament. Thus, there are tails forming the compact part of the filament and heads protruding at the surface. In this way, those actin filaments in contact with a myosin filament are always dragged toward the middle part of the myosin filament. This process is the molecular mechanism for muscle contraction and animal movement. In the smooth muscle, the interaction between actin filaments and myosin filaments is mediated by phosphorylation of myosin heads. In this way, all the process of dragging actin filaments by myosin is slower because kinases are needed. Sometimes, actin filaments are able to move organelles in a weird way: a short actin filament becomes attached to an organelle by one of its ends and the polymerization (elongation) of this filament pushes the organelle through the cytosol. Endocytosis and phagocytosis.In animal cells, actin filaments are usually located close to the plasma membrane, in the so-called cellular cortex or periphery, although they are also found in inner places of the cell. The peripheral localization is suitable for participating in endocytosis and phagocytosis. Formation of vesicles in the plasma membrane is not accomplished if the actin filaments are inhibited. Furthermore, the cellular protrusions, needed during phagocytosis to engulf particles, depend on the actin filaments polymerization. Cytokinesis. The final constriction of the cytoplasm during cell division is produced by a ring of actin filaments that, helped by myosin motor proteins, gets progressively smaller in diameter until the complete separation of the cytoplasm of the two new cells. This process is mediated by type II myosin. Membrane domains. Actin filaments may influence the lateral movement of proteins of the plasma membrane by acting as physical barriers, like fences, on the cytosolic face of the plasma membrane. In this way, actin filaments are able to delimitate areas where the movement of the proteins are confined, and hamper long lateral movements by diffusion. Microvilli. Microvilli are filiform expansions of apical part of some cells, particularly abundant in epithelial cells, where they increase the surface of the plasma membrane (more than 30 %). For example, they can be found in the epithelium of the gut and in the proximal tube of the nephron. Every of these little expansions or microvillus are 1 to 2 µm height and around 0.1 µm thick. They contain several dozens of actin filaments oriented parallel to the longitudinal axis of the microvillus. These filaments are interconnected by proteins like myosin, fimbrin, and vilin, and together form a strong scaffold. Furthermore, thanks to other intermediary proteins, the actin filaments are anchored to the plasma membrane. At the base of microvilli, in the peripheral cytoplasm, there is a net of proteins known as terminal web, which is composed of actin filaments, spectrin, myosin II and tropomyosin. The terminal web connects the actin filament of every microvillus between each other and stabilizes the whole set of microvilli.